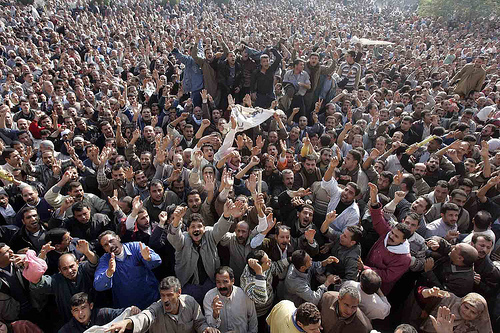 The ongoing Egyptian revolution has captured the attention and sympathy of people around the world. This is helped by the worldwide availability of internet access and social messaging devices. 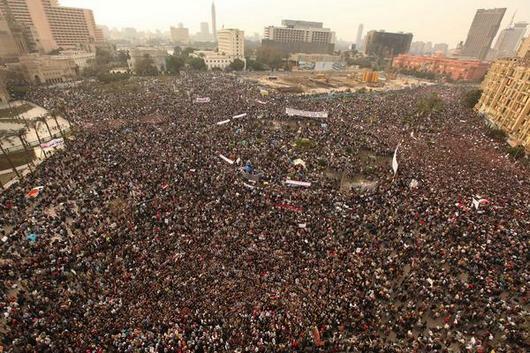 Even when the Mubarak regime cut off the internet, demonstrators were still able to get their message out. A warning to tyrants everywhere. Twitter has been full of messages of support. And it is amazing what can be condensed into 140 characters. I like the simple messages which used the image of software installation on a computer to make a political point. For example this for d@dn2k which makes the point that Mubarak’s downfall is just the start of the beginning. Egyptians certainly do face some huge political tasks with many opportunities and many pitfalls. The army’s support is essential for any new regime – and there will be an ongoing struggle by all sides to exert influence here. And some commentators have been preoccupied with the possibility of extreme Islamic groups influencing the revolution. I have been heartened by the discipline and peaceful nature of the protests. Most violence seems to have been instigated by the security forces and stooges of Mubarak’s regime. The occupation of Tahrir Square over such a long period reveals a welcome degree of organisation. Protesters have organised to maintain their control and to provide services for the occupiers. I hope this demonstrates that the various political forces within the protest have been negotiating among themselves to build a basis for unity. Also that they have been negotiating with the army and elements of the old regime to build some sort of trust and agreement on transition. The protest itself has had a strong secular character. There has not been a preoccupation with religious agendas. At the same time the protests have not been sectarian. This was demonstrated by the cooperation of majority Muslims with minority Christians. Even to the extent of providing protection for each others prayers and services. Even cooperating together with some of these. The unity and secular nature of the protest, and the revolution so far, are positive indications for the near future. But to get back to Twitter. there has been some comment that the successful revolutions in Tunisia and Egypt will encourage people in other countries to demand their human rights. Already we have seen big protests in Jordan and Yemen. Daisy McDonald used another computer graphic to suggest world wide possibilities. @eddieizzard MT @jmgoig Please wait while uninstalling rest of dictators of the world: â–ˆâ–‘â–‘â–‘â–‘â–‘â–‘â–‘â–‘â–‘â–‘â–‘â–‘â–‘â–‘â–‘â–‘â–‘â–‘ #egypt #jan25 <–fingers crossed! I wish them all the best. It is one thing to be united in your desire to get rid of a tyrant. It will be another thing to get a majority view on who should become the next government.